About Darvills Rare Prints, fine antique prints and maps since 1918! The above photo shows the home of Darvill's Rare Prints from 1942 through early 2007. After 65 years in the same Main Street location in Eastsound on Orcas Island, Washington, we decided to close the "brick and mortar business" to concentrate on serving our global audience exclusively through our website. Thanks to all who visited the shop over the years. Please be sure to come back to the website regularly, as we add to the site regularly. A little about our history... Fred T. Darvill was a British emigrant who came to the United States in the late 1800s. He was hired to help his uncle sell law books out of Chicago, Illinois. When he went out to see potential law book purchasers, he took along antique engravings and etchings related to law. The lawyers turned out to be more interested in the prints than the law books! Shrewdly, Mr. Darvill enlisted his 10 brothers and sisters in England to send as many antique engravings, etchings, lithographs, etc. to the U.S. as they could. Thus, Fred T. Darvill established the business in 1918 and was located in Salt Lake City and San Francisco before moving to Orcas Island in 1942. In 1971, at the age of 90, Fred T. Darvill sold the business to Dale & Catherine Pederson. The Pedersons operated the business until 2004 when Wade Campbell & Chris Brussat took over as just the 3rd owners in the 100 years of Darvill's history! In 2007 we made the difficult decision to close the shop on Main Street in Eastsound, where the business had resided for 65 years. We now are offering our amazing collection of rare prints and maps exclusively online. This way we are able to provide our treasures to the entire world. Please check in often, as we are continously adding vintage and antique prints and maps to the site. The selection is constantly changing. In addition to the multitude of art covering the past 300 years, Darvill's is pleased to offer the whimsical limited edition prints by Rie Muñoz. Rie had a cabin on Orcas Island for many years and has featured several local scenes in her wildly popular limited edition prints. 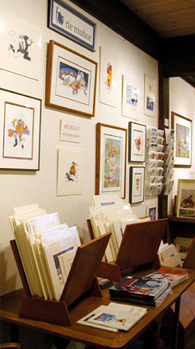 As official Rie Munoz art dealers for over 35 years, you can be certain that we have one of the largest selections of genuine, artist-signed prints anywhere. Should you not find the Rie Munoz print you are looking for, please contact us. We may be able to find it for you. 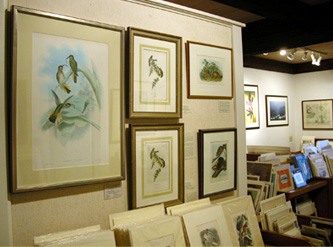 Darvill's Rare Prints has one of the most extensive collections of engravings, prints and lithographs anywhere. Gleaned from dozens of European sources over the past 100 years, these prints cover a wide range of subject matter. They are often beautifully framed and yet moderately priced. Perusing our massive website, one finds Hogarths, Curtis botanicals, and so much more. There are eighteenth and nineteenth century road maps, architectural engravings and legal documents, as well as early twentieth century magazine illustrations and calendar art. Finds like an original plate from the first edition of Captain Cook's Voyages, or an early color lithograph from the United States Railroad Survey abound. Wade and Chris will continue to add to Darvill's collection of both rare antique prints and rare maps. We sincerely hope you enjoy browsing our site. 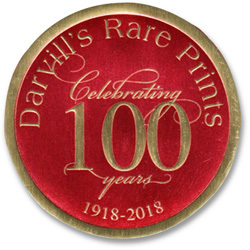 Here's to the next 100 years of Darvill's Rare Prints!